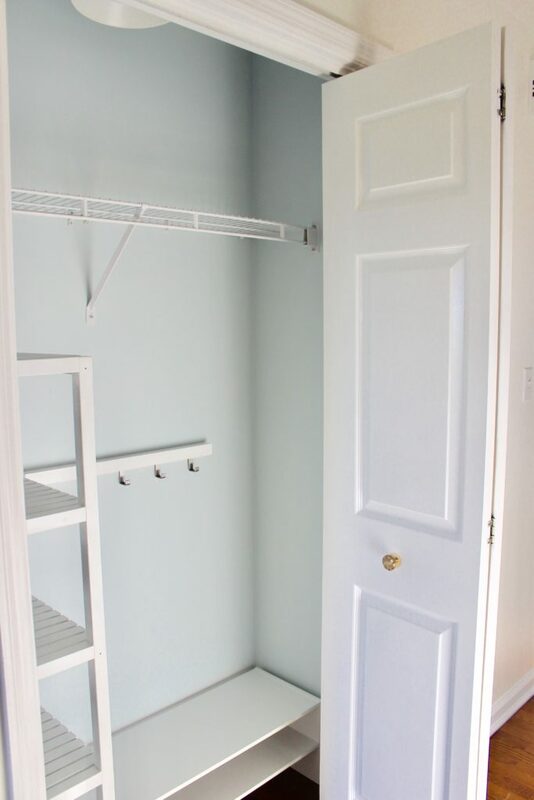 Closets turned mudrooms can be elaborate spaces with art, plants, decor and more! Or, they can be as simple as an organized space with a hook rail, shoe rack, and basket tower that works when your family needs it most. The key to keeping your space simplified is to pare down while also using storage options that are unified in color or material for a clean appearance. 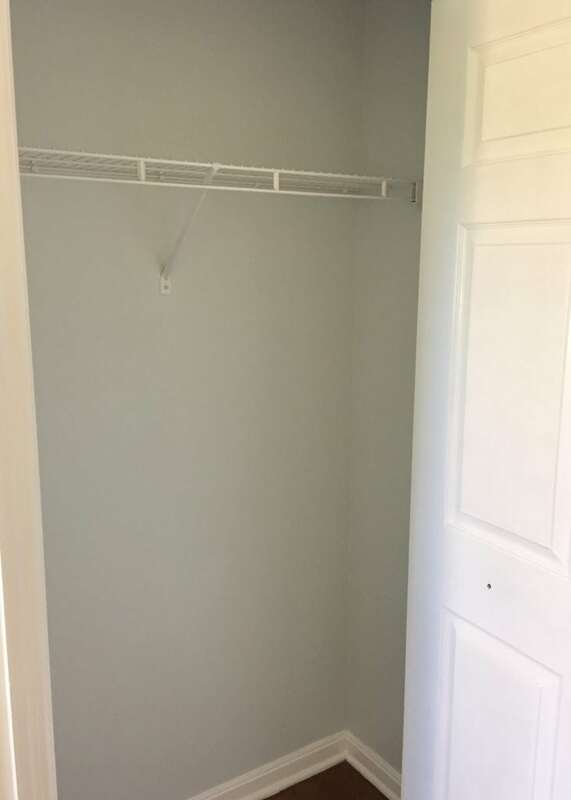 This closet began like most entry closets do, with a wire shelf and hanging rod. However, it needed to house shoes, gloves, hats, coats, and backpacks while being easily accessible. The first step is to clean and apply a fresh coat of paint taking it all the way onto the ceiling. Many would skip this step, however, this impossible space felt brighter and more manageable after this simple task. Use this opportunity to do something unexpected by applying a peel and stick wallpaper in a fun pattern or a bold paint color perfect for a small space. 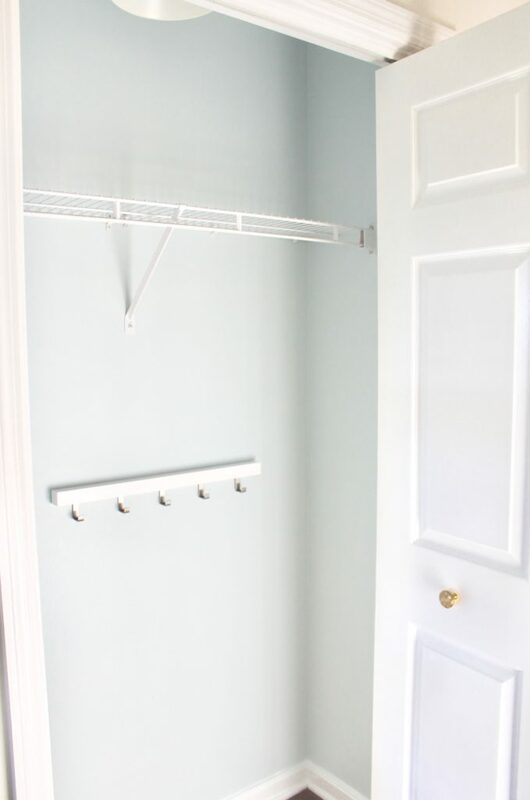 In trying to stick within a small budget, this closet received a coat of leftover paint from a bathroom remodel in a calming blue. This closet did not have a light inside, nor did it have one just outside in the hall way. The door, when opened, blocks the entry light from shining inside. So the next step was to install a light. 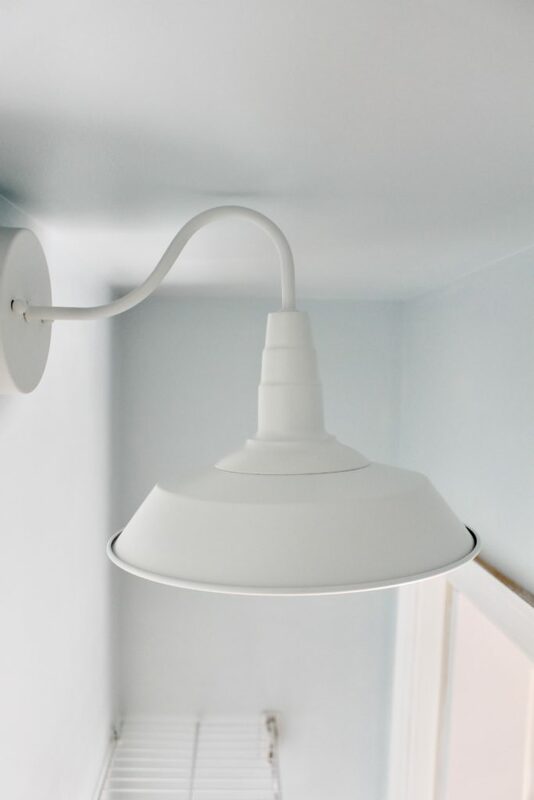 Although a hardwired light could have been added, it can be costly and time consuming. Adding a mounted sconce with a remote control puck light solves this problem easily. 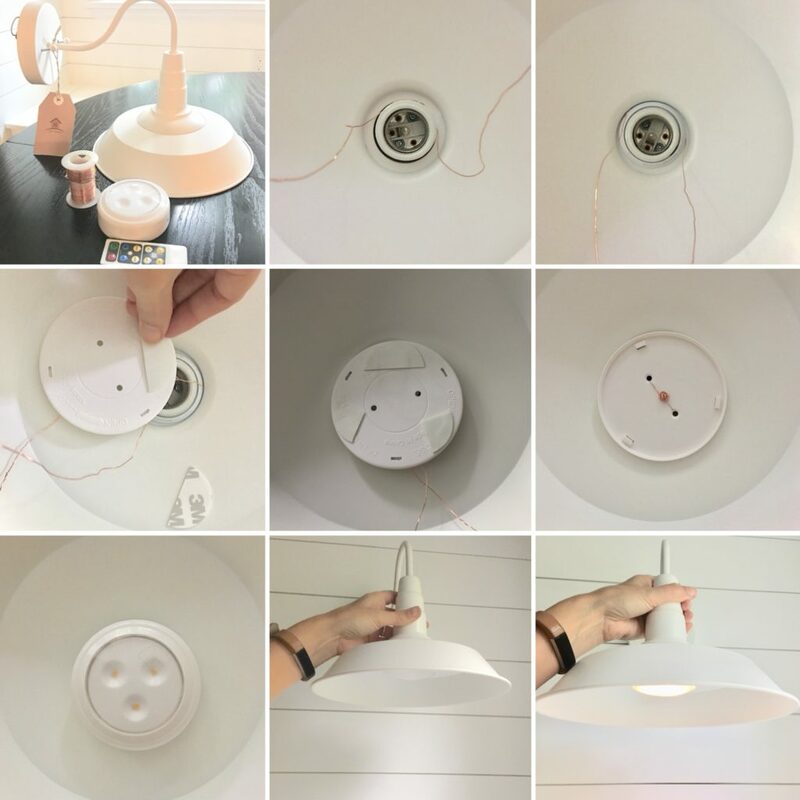 Designers and bloggers began using puck light sconces for spaces where hardwiring wasn’t an easy option. Closets or kid’s bedsides are great uses. If using in a kids room, nighttime readers know when the timer turns the light off, it’s time for bed. Wrap wire around the part of light fixture that would normally hold a bulb. On the backplate of the puck light place a 3M strip that will touch the light shade for extra hold. Thread the wire through the backplate of your puck light securing it to the shade with your 3M strip. Twist the wires for a firm hold. Twist the puck light onto the backplate mounted to your shade. The puck light operates with a remote, or by touching the light. Mount directly to the wall. After the sconce was installed and the remote placed on the inside of the closet using a command strip, it was time to hang a hook rail for backpacks. Measure each of the bags you’ll be hanging to ensure there is enough space for the shoe rack below without overlap. Hook rails can easily hold soft baskets, umbrellas, bags and more, making them versatile for any space. Measuring the width of the closet, there was enough space for a shoe rack that holds 12 pairs of shoes neatly and a basket tower. 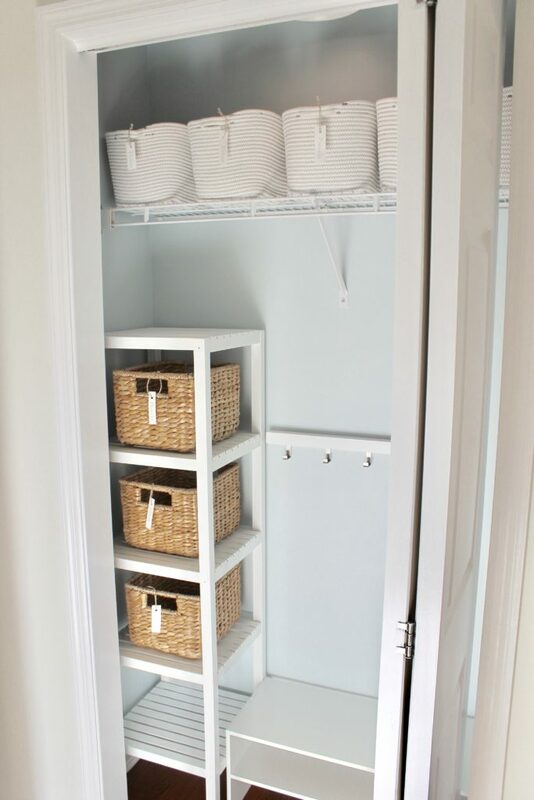 Vertical storage baskets keep most often used items accessible. In the summer this may be a favorite hat or sunscreen, in the winter it can store gloves, hats, lotion and chapstick. Each basket is labeled with a computer printed name, laminated in packing tape, and hung with twine. The basket tower used for this space was an item shopped from home. Originally an orange wood stain, it was spray painted with a few light coats of semi-gloss white to unify the space. Before placing the baskets onto the tower, add felt pads to the bottom corners of each basket so paint does not scratch or chip. Finally, place soft baskets with handles to the top shelf for seasonal outerwear. Soft baskets are perfect when storing high items. When they need to be reached, the labeled baskets are easy to grab and lightweight. The two empty shelves on the basket tower can hold a purse and library books waiting to be returned. This quick makeover now works harder and smarter for our family. With the added remote control light, we can see all the items in our closet with a touch of the finger. 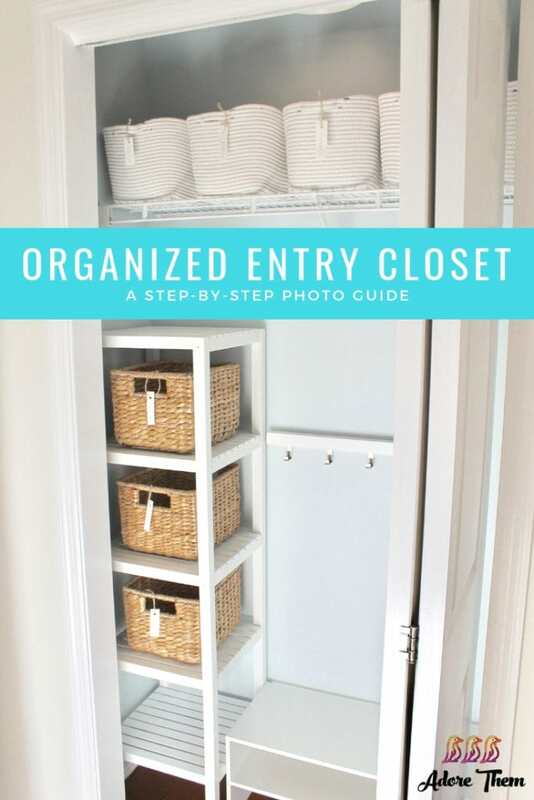 Remember entry way closets can easily become a hoarding zone. To keep your space simplified, every few months remove out of season items. 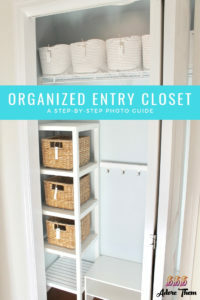 I hope this inspires you to simplify your closet space to work better for your family.